Today’s technology is incredibly fast paced and increasingly convergent. This movement is intensifying at logarithmic speeds with little thought for issues such as scaling or inter connectivity. Like any period of change, this brings great opportunity accompanied by great risk. Over the past couple of years we have seen several major inverter manufactures begin to foray into what was traditionally known as the automation and controls sector. 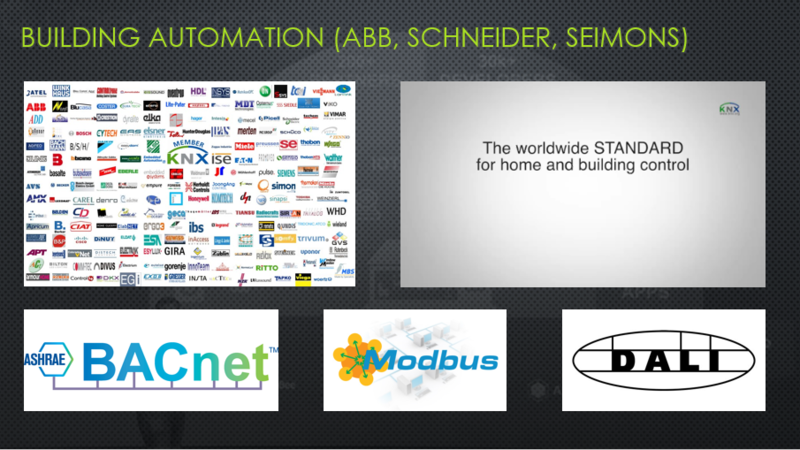 This segment of the electrical industry has been traditionally driven by key engineering firms such as ABB, Schneider and Siemons, but is now under going a frenzy of new development with new entries – not just from within the energy industry, but also from major appliance manufacturers such as Samsung and LG, and silicon valley majors such as Google and Facebook. Every entrant claims they have THE product and every incumbent claims they have THE system. Every system comes with its own protocol and integration challenges leaving industry representatives and consumers alike struggling to identify a clean approach. Where are we heading with all this? What will the end result be? In all honesty no one has a firm answer. Before we can even get to that stage we have several key issues to confront, such as how will we define our transport mediums and application layers? What languages will we use to integrate them and how will we translate that into a slick UI that will appeal to consumers? Around about 25 years ago the automation industry realized that it had a segmentation problem and that it was in its best interests to try to look towards common platforms and communications methods. Most people in this room would be familiar with why we standardize things and would also be aware that there are plenty of challenges that accompany that process. The largest issue has generally been trying to liaise between bickering manufactures who all want to own the next big space. Well plenty of progress has been made, but 25 years on that battle is still raging on, and if anything, is showing every sign of been disrupted before it can even conclude. The IoT vision would do well to learn from this history, as it has been one of the single largest barriers to mass market adoption in the automation sector. Consumers want accessibility. They don’t want closed systems and they don’t want to have to call an integrator every time they re program a light switch. Where are we at with standardization? Unfortunately we’re a long way off any sort of universal system, however it pays to be aware of the major protocols and select products around them, as this will give you a greater chance of future integration and or ongoing product support. 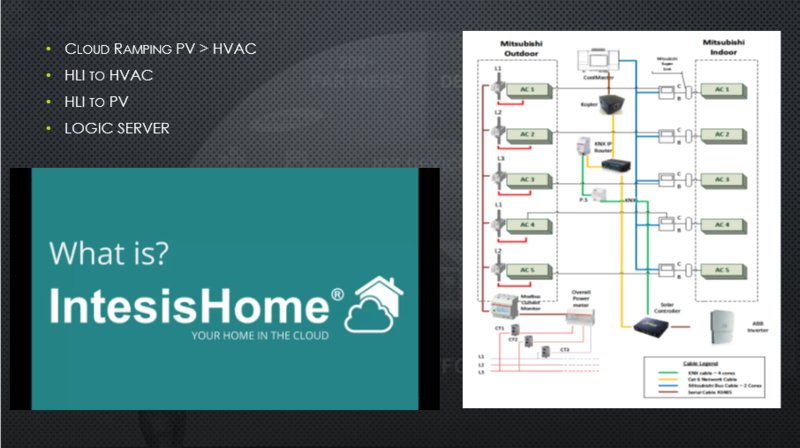 In this slide we can see the two behemoths, KNX and BACnet. They both have their quirks, but essentially they are internationally ratified, open standards which manufacturers produce products for. Think MODbus on a more complex and larger scale. The key advantage that these two standards have is they are open source ie manufacturer agnostic. These protocols are used to piece together what is commonly termed, ‘the head end.’ Underneath these systems are a number of other significant protocols. MODbus is probably the most familiar within this group and comes many industry specific variations including our very own Sunspec. Sunspec defines a specific register and address set for use on the MODbus protocol so that many inverter manufactures can talk to each other across a common format. This sort of standardization is critical for system integrators to be able to quickly link and trigger auxiliary devices without the need for additional gateways. DALI is a key lighting control protocol and can often be found working as a sub layer within KNX or BACnet systems. In modern day examples, we are also seeing the emergence of wireless protocols such as Zigbee or KNX. This can be confusing, however the architecture of these buildings has evolved around redundancy and response – something which is sorely lacking in many http implementations. How are these protocols used in a typical building control system? Why are there 4 layers? The issue is that integrating a device is anything but plug and play. A connection requires an addressing system and a definition of data types. To put that into English, you could ring up 4 different courier companies. They will all need your address to find the right place and they will all have slightly different packaging requirements that will then work with their systems. Some couriers will be better at large parcels. Some will specialize in moving lots of small parcels very fast. These protocols are no different. Can you transmit metering data on KNX? You bet. It has a robust addressing system with close to a hundred or more data types. What happens if we put 300 tenancy meters onto the building backbone and start messaging at 1 second intervals? Like any network it has its limits and like any network the end result is lag, or a complete crash. There are other key issues such as product availability. In many cases it is simply cheaper to have a MODbus meter talking to a KNX control system through a gateway or logic server due to the fact that MODbus is the most commonly available metering format. Why don’t we just IoT the lot? Isnt there an API for that!? There are millions of existing MODbus meters in buildings all over the world and even the latest EDMI smart meters are been rolled out with protocols such as MODbus, Zigbee and 4G. Protocols such as Enocean are what will *enable* us to retrofit older buildings, making IoT impossible without them. 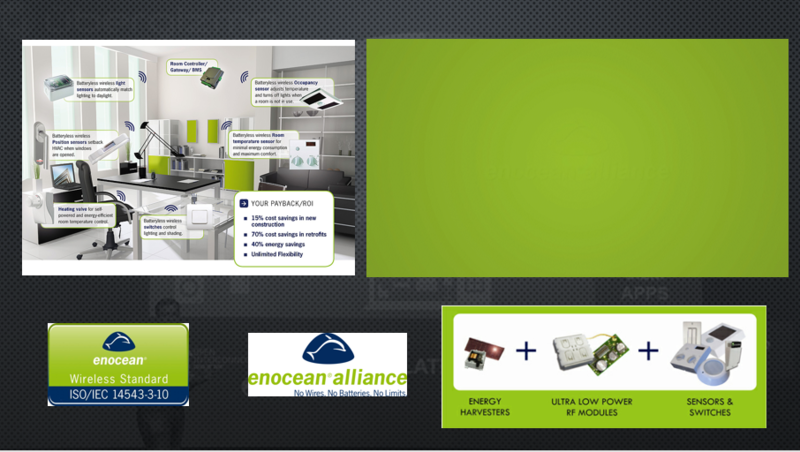 Enocean is an interesting niche in that it defines a self meshing wireless network (like Zigbee) alongside a kinetic energy harvesting system. This enables simple devices to transmit and operate based off the kinetic input of the operator. Be that the person pressing the switch, or the sun delivering energy to a window sensor. As system integrators, it is up to us to deliver the magic which makes that experience possible. Lets start with something familiar. The Renewable Energy sector has long skirted around the edges of automation, but rising electricity prices have given an added sense of urgency to recent product developments. From our side of the fence, its not about selling a Jetsons like living experience, it’s a purely economic approach which revolves around maximizing the capture of renewable energy production. In the Sunny Portal shots above, the first image shows a standard solar system with no batteries. By now every installer worth their salt is utilizing time clocks or programmable relays to drive electric hot water systems, and with thorough design can capture a further 4-7kWh of production without utilizing a battery. This is shown in the slide as the sudden 3.6kW load at roughly 8AM in the morning. Historically we would set this using a timeclock, however as we know the latest technology will trigger from solar production and or upon export. Some models will do this using off delay timers, whilst the more advanced units such as Immersun (pictured) or AWS will ‘shift’ the output using high frequency transistors. The problem with timeclocks is that sometimes the clouds don’t align, and whilst this problem is somewhat reduced through off delay timers, the only method of ensuring absolute accuracy is through high frequency switching. But what about the remaining export? And what about people who don’t have electric storage heaters? 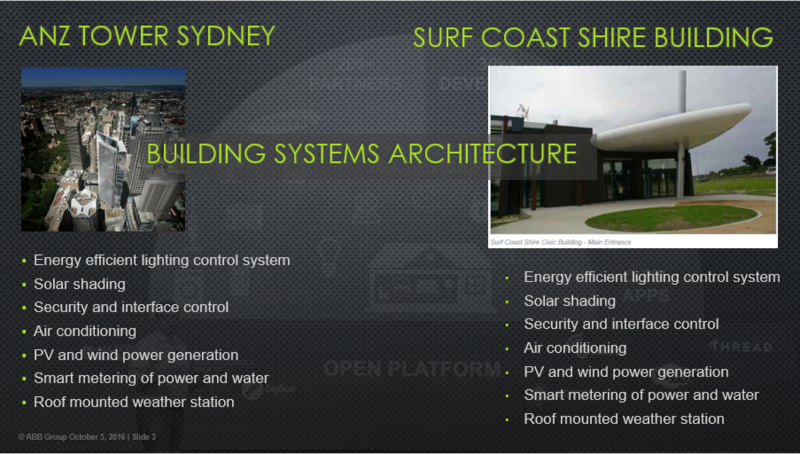 The bottom SMA slide shows a 6.5kW array attached to a Sunny Island with 7.5kWh of usable LG storage. In this particular example, the customer is exporting 18kWh to the grid and taking losses of up to 25% through battery conversion. It is this remaining energy which provides further opportunity not only for our sector, but also for appliance manufacturers and energy trading platforms – to capitalize on the exported gap. 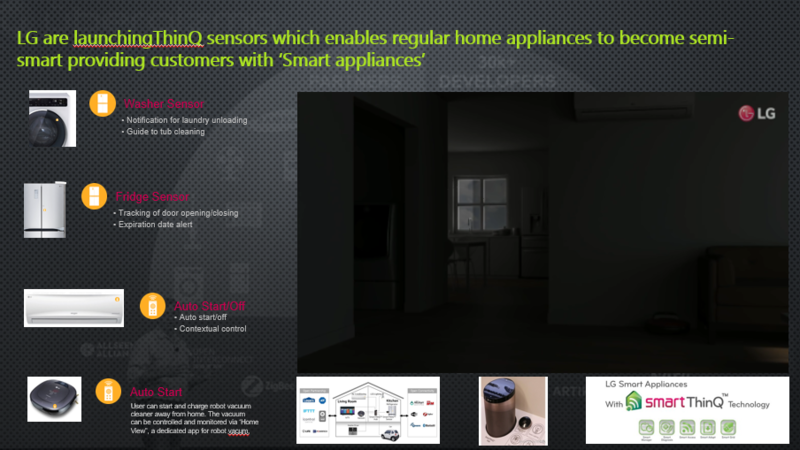 In many ways, smart appliances are still in the concept stage. It is easy to think that these next generation devices are decades not years away, but the fact is we are already seeing initial forays into the market and that is to be followed by a flood in 2017. The first range that I cam across was Miele@Home on display at Light and Building in Germany in 2014. Light and Building is about 15 times larger than All Energy with manufacturers such as ABB bringing stands that cost literally millions of dollars to build. KNX is a central part of Light and Building and at every bi annual event, each manufacture contributes to a ‘KNX city’ that displays an integrated world, not just in a residential environment, but also covering universal building types and the interaction that can happen *between* them. 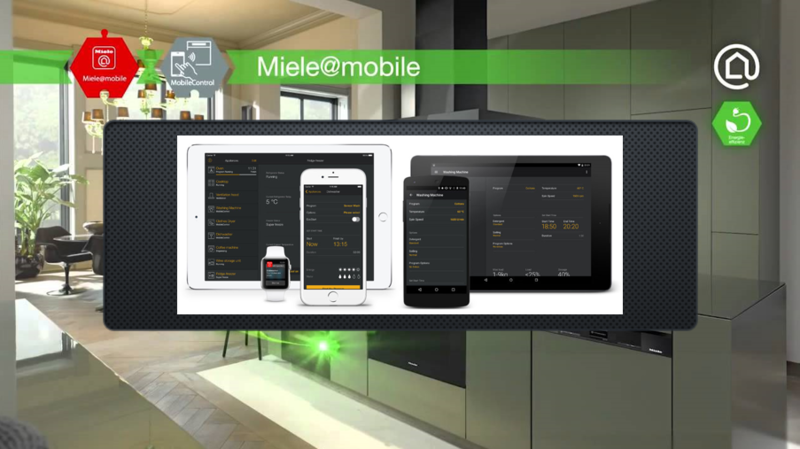 Miele’s range is based on KNX and offers a high level interface to most appliances in the kitchen. Want to pre warm the oven on your way home? No problem. Tell the refrigerator to defrost? Can do. How about order food from your fridge? Yep that’s possible. As enticing as this sounds, there are two things which have held it back. One is the price tag, however it is number two which has caused far more delays and that is applying the wisdom of, ‘just because I could, doesn’t mean I should.’ Many people who have installed these find that its far faster to change the lights from a switch, than it is from an app. In short, the appliance manufacturer’s are scrambling to find an identity. They are searching for the features that they ‘should’ implement and this is why it is taking them so long to release what is already well established technology. Whilst all this product development is emerging. There are a number of other key issues that are coming to light. Everyone knew that protocol standardization would be a key issue, however scaling has seen new problems emerge. Early adopters often spend tens if not hundreds of thousands of dollars on high end systems, which rarely truly deliver the dream that they were promised. Law suits ensue. Many proprietary systems have seen manufacturers disappear, leaving building owners with defunct systems that are unable to be supported or repaired. No where is this becoming more apparent than in the rapidly growing ‘cloud’ sector of the automation market, where we are seeing data ownership issues, connectivity problems and outright lack of product support. Here we can see the results of a quick search for ‘Google Nest Down.’ The problem with these devices is that they cant maintain full functionality without a data connection and are therefore open to becoming ‘brick’s whenever a manufacture decides to pull the plug. We are also seeing not just data, but also hardware ownership issues. Who owns the smarts of a building upon sale? 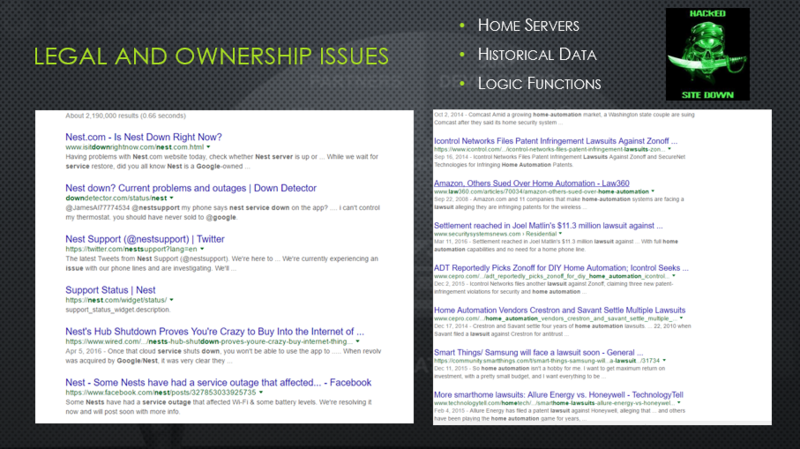 IF a homeowner removes a logic server, does the building still work? That all aside, its absolutely certain that the cloud will play a major part in tomorrows IoT world. Both Google and Apple are effectively playing games in this space, with niche devices that they see open to disruption. Smoke alarms which measure light, humidity, movement and C02 are attractive when compared to hard wired bus devices which may not deliver all of these functions. Applications such as IFTT and Zapier are allowing us to automate and integrate our existing systems with smart little functions that free up our lives from repetitive and mundane tasks. Want to save email attachments to Drive? Zapier can automate that for you. Like to subscribe your clients to Mailchimp? Zapier can do that too. IFTT is another cloud logic platform which allows us to automate simple functions across complex platforms. IF Im near my house THEN turn on my lights. It achieves this through the use of API’s and cloud translation. Setup a geo fence and use that to send a command to the automation server. The only problem with Silicon Valley is that its *never* as simple as it seems. There are some very significant problems that are occurring as these products scale including latency, lack of redundancy and data security. Where are all the appliance manufactures in all this? Next year is looking like the avalanche of smart appliances with both Samsung and LG penciled for release. Both are claiming an open platform with plenty of integration possibilities and plenty of competitors will be quick to follow them. 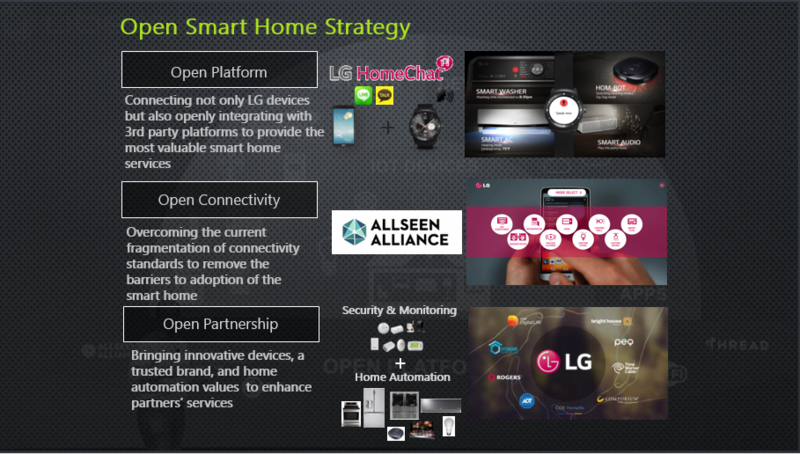 LG have developed a modular system called ThinQ which upon close inspection shows that they understand some of the key isses with implementing this technology. As a modular system it enables consumers to pick and chose what they ‘should’ whilst also allowing them to own the devices themnselves, and most importantly ensure that they work without constant connection to the cloud. One of the key advantages that appliance manufacturers have is that their products already sit in the middle of every day homes. This will help them to quickly convince people that they should and in many cases use content and integration functions to move from could to should to must. These smart appliances offer the RE sector a number of load shifting opportunities which will absolutely be almost invisible to the consumer and close enough to plug and play for the integrator. OK enough dreaming – lets get down to business. What are some of the ways we can expect to maximize energy production and how will we go about it? There are two things that will happen here. One is that inverter manufactures will continue to integrate essential load management functions such as relays and analogue outputs. SMA have offered this for years. Fronius have taken it further, and ABB’s REACT is about to push it even further again. At the same time we are seeing new products emerge. 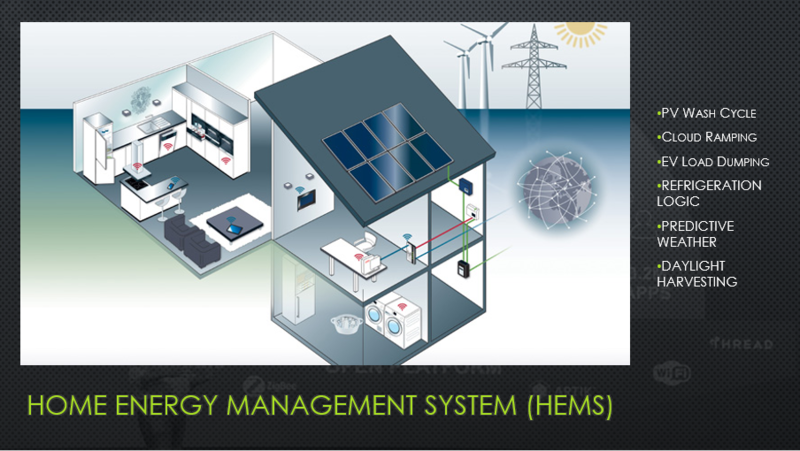 Home Energy Management Systems or HEMS for short. Essentially these are building automation servers which focus on energy managerment, rather than trying to live like the Jetsons. They combine functions such as metering and load switching with predictive algorithims designed to maximize pv output. 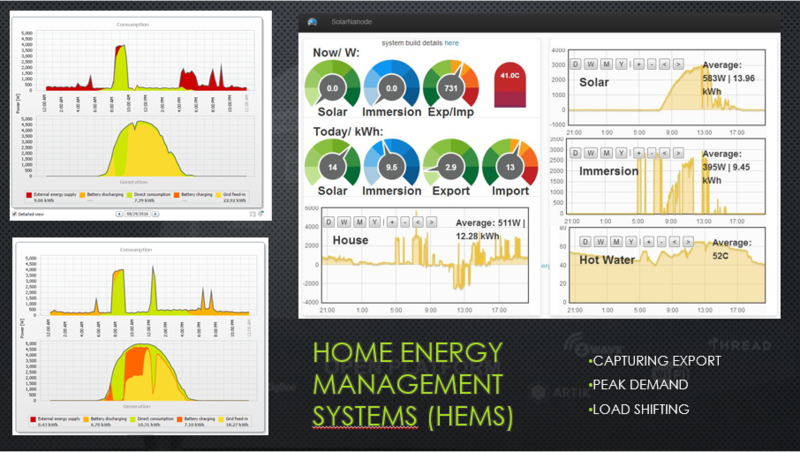 Examples include Sunny Home Manager, Carbon Track and Reposit. What can we achieve with these devices? 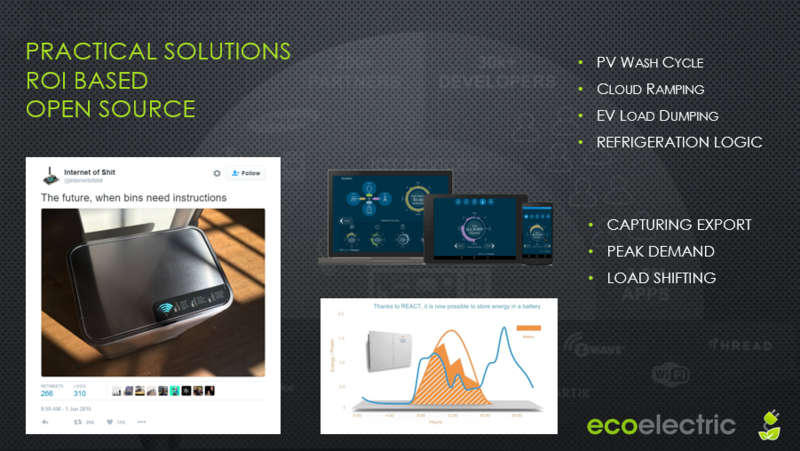 PV Wash Cycle, AC Cloud Ramping, EV Load Dumping, Refrigeration Logic, Predictive Weather and Daylight Harvesting. This was a quick list put together whilst waiting for a glass of water on Tigerair. In short, anything is possible once we start to bring all these systems together and we can absolutely target 100% utilization – possibly with far less storage than what was originally envisaged. In the commercial space the implications are huge and will have a large effect on peak demand. Day light harvesting is already reducing lighting costs by as much as 30% and we are now seeing interactive ramping technology installed into flagship RE sites which enables the HVAC or refrigeration systems to operate around energy output. This can be achieved through KNX in its most simple sense, or by using a combination of KNX, MODbus and BACnet at larger scales. In the slide above we can see a bank of split systems that are attached to multiple building spaces. The RE system is talking to KNX via a MODbus gateway and the logic is happening in the dedicated server. The ramping is happening via an appliance gateway which then allows us to shift the set point of the units up or down depending on weather conditions. Initial data shows that energy savings in the realm of 15-20% are likely and that solar utilization is also massively increased. The real beauty of open standards in systems like this, is that many methods become possible. An existing HVAC system may already have BACnet data such as room temperature available. This would allow us to fed that data back into the system to further increase efficiency without needing to install additional devices. Current design methodology is firstly to focus on what we can do with the equipment at hand, but also to select that equipment with a vision focused on futher compatibility. Luckily there are several smart cookies making all this possible and there is every possibility that every home could see a logic server and NAS drive become more important than the tv. There are several problems that these systems are designed to overcome. One is they do not rely on the cloud. Two is that when combined with smart devices such as KNX, the offer complete redundancy. The system doesn’t stop when the logic server does and the serve doesn’t stop when the internet goes down. Number three is translation. And all in one very smart box. At this stage its too hard to say if translation may move to the cloud, or if it will stay in the home. If we look at it from the RE perspective then we want it to stay in the home, for all the same reasons that we want energy generation to be in the home. Lets look at a couple of devices. For the residential market I find it hard to look past Loxone. 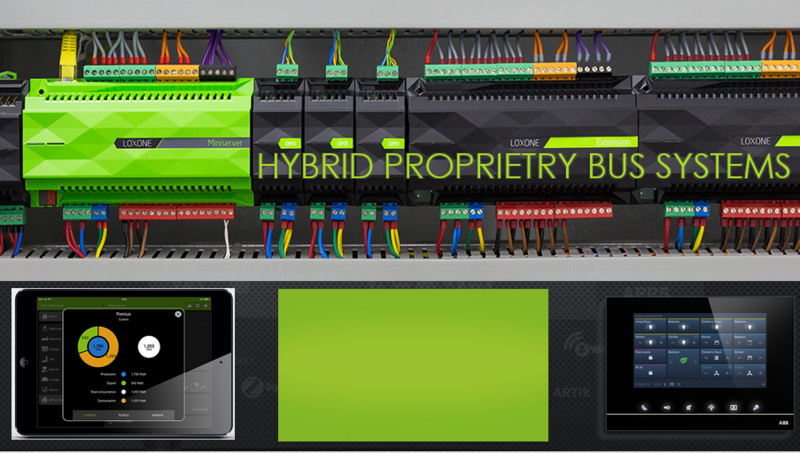 Their kit comes packaged with a KNX gateway and will allow virtual connection to MODbus TCP servers. What does this mean? Take this example. Most SMA inverters have an onboard MODbus TCP server that can be activated through Sunny Portal. By turning this on, I can create a virtual port on the Loxone and then use that to pick up any number of Sunspec parameters. Battery SoC or PV output been the most likely. If that doesn’t make your heart start racing, Ill spell it out for you – the Loxone can then use that data to trigger any appliance on the network at any threshold. We are currently implementing a project in a community that is installing a large central off grid system that requires complex load shedding capability. The Loxone will allow us to load shed individual cabin functions before the central building goes down, and in many cases do it without installing wiring. 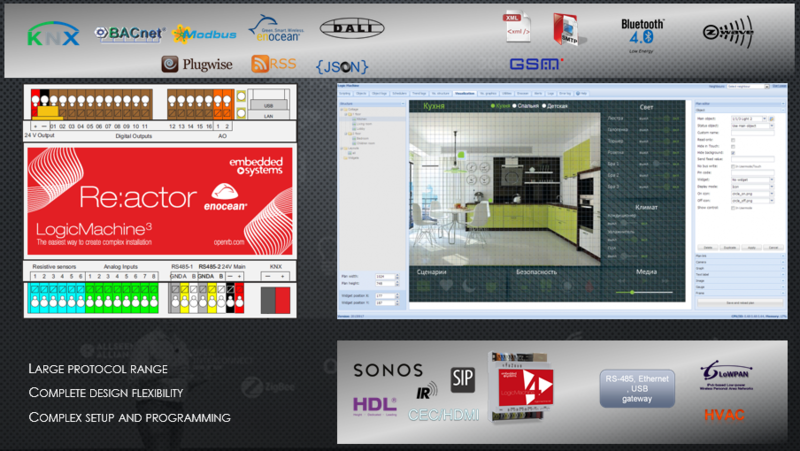 It also neatly delivers visualization and remote access capability for both clients and integrators. In the commercial space I would recommend Logic Reactor or ABB’s Eiasbear. ABB have the most user friendly solution in this space, but it comes at a cost. For those that are more technically minded or who are determined to save some money at any time cost, they may be better off looking at Logic Reactor for the sheer fact that its hardware gateways alone add up to more than the cost of the unit itself. Logic Reactor retails for around $1800 and Eiasbear starts at around $2000 for a hardware package. These systems are capable of controlling true enterprise type buildings such as universities and airports and allow completed customization on control and application layers. Where do we go from here? For the RE industry its important to stay focused on practical solutions that are ROI based and preferably packaged with some sort of known protocol. 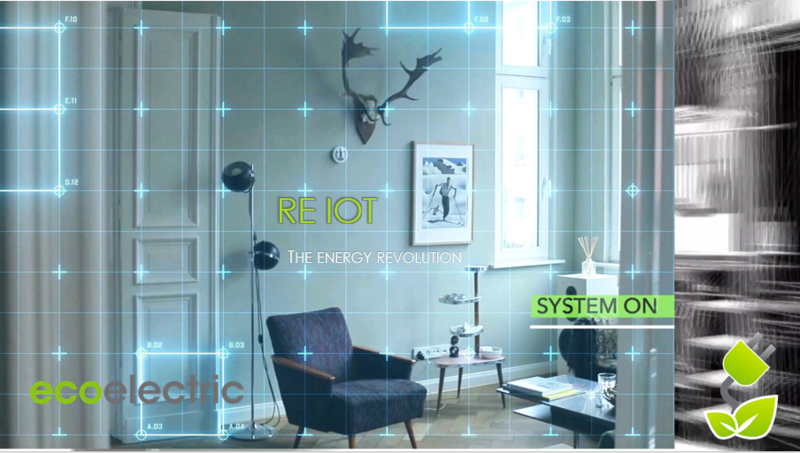 I feel that unlikely we will be able to truly maximize energy efficiency without additional controls however an open standards approach should allow us to easily tie in with smart appliances and accept data from IoT sensors. They key is to rememember that just because we could, doesn’t mean we should and that for us, its all about capturing the space between the gaps. Thanks for listening and have a great week. No worries Colin, its a bit of a passion topic of mine and one that is constantly evolving. Follow Admin's board Fit Outs on Pinterest.